The time between starting the cut and there being a big enough hole for a marine to fit through seemed interminable to Barsk. 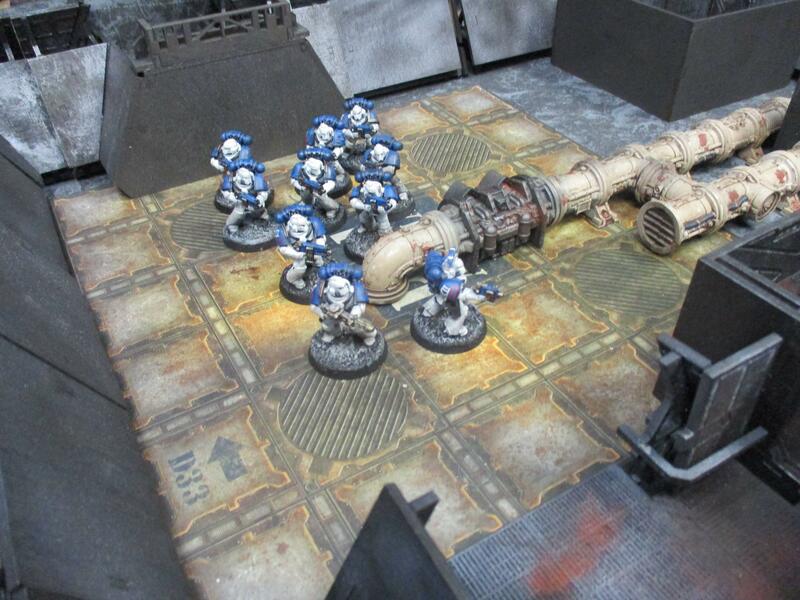 When they were aboard ships he sometimes wished that when they designed Astartes they had halted the growth of the candidate instead of accelerating and enhancing it. Twenty seconds is all it took for the lascutter to burn a marine sized hole through the bulkhead but 20 seconds is a long time for transhuman combat and they could hear the counter-boarding parties moving towards them. 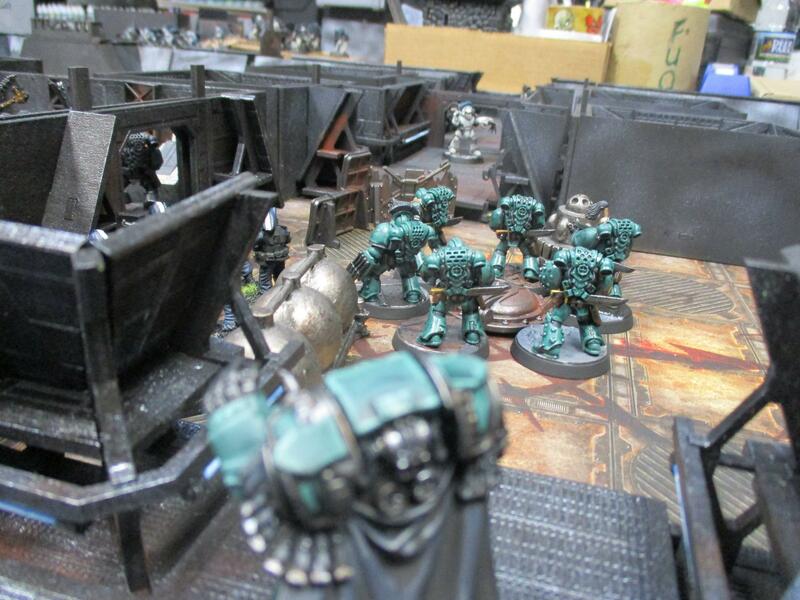 The Skran kicked the newly cut metal as Barsk cut through the last section and the sound of the enemy was obscured by the loud clang of the metal sheet hitting the deck on the other side of the wall. "Get to level 12 now, we are taking out the air-purifiers. We'll see how they operate this ship without a mortal crew," came Keth's orders over the vox. Barsk grunted, they were on level 12 and right in front of a re-concentrator. "Well, well, well," he said as he moved forward towards the long metal pipe. In moments a burst of flame gushed out of the machinery covering the wall in thin layer of carbon before alarm lights started blaring down the breadth of the room they were in. There was another one further down the room. Sergeant Lorm was on it before Barsk could get there and he smashed into it with his power fist. The machine belched form flame in a dying exhalation. They could hear gunfire and the sounds of fighting over the vox. 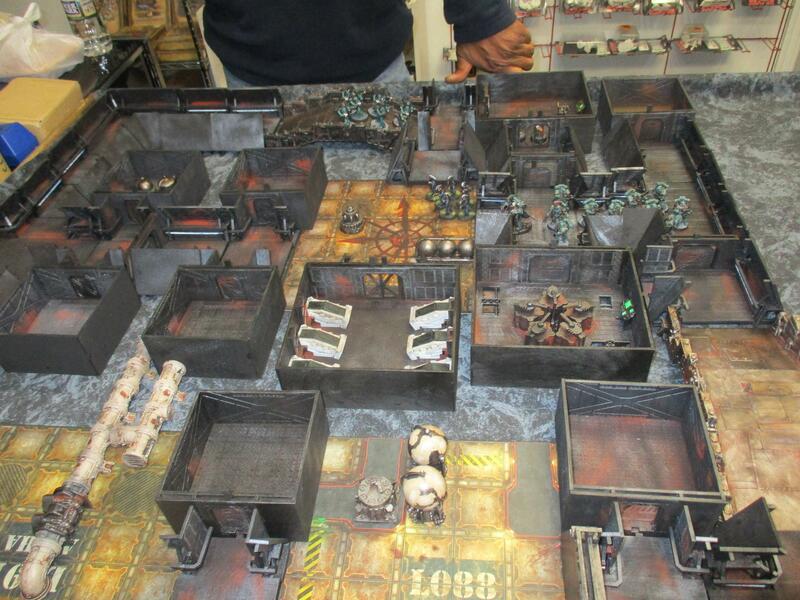 It sounded as though Squad Maag had emerged into the thick of the enemy and were paying the price. They could hear the sounds of gun fire through the vox and through the bulk head now and could see the wall shuddering from the impact of bolt rounds. "Into the next room, the main generator for the circulation system is in there," said Lorm. There was no door to the next room so Barsk got to work on making one. But just as they started cutting the hammering against the bulkhead beside them increased. 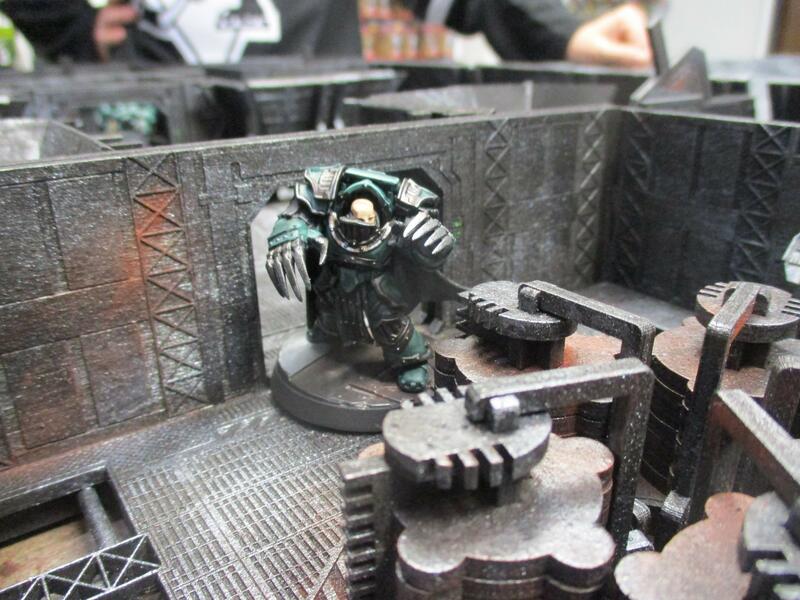 The wall bulged out at one point suddenly and then a moment later a powerfist sent fragments of plasteel towards the World Eater squad. The Reavers were coming for them. Lorm pushed Barsk aside and punched the almost completed portal and the the metal fracture under the blow, one more punch at the area not yet cut through and their new door fell into the room. 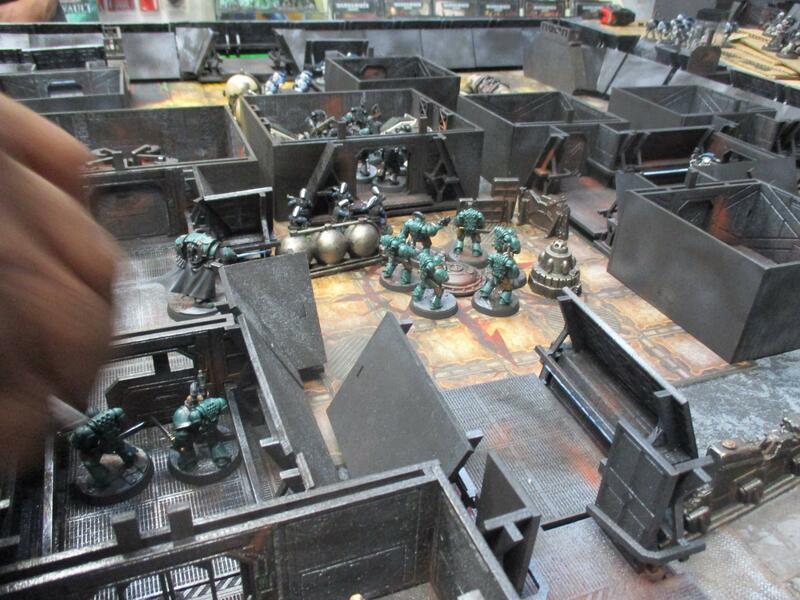 The squad scrambled through just as the Reavers burst through the wall behind them. There was a massive piece of pumping equipment that took up most of the room and the pistons for it were moving up and down furiously. It would take a few moments to shut this down. They might not have it, as the smoke from the lascutter cleared a massive figure was revealed in the doorway. Twin lightning claws gleamed in the gloom illuminating the form of a marine wearing Cataphractii pattern tactical dreadnought armour. "Gervoth," came a scream over the vox and from behind the Terminator. The massive warrior turned to face Keth as the Sergeant's lightning claw raked down the back of the traitor captain's armour, shredding his cloak. 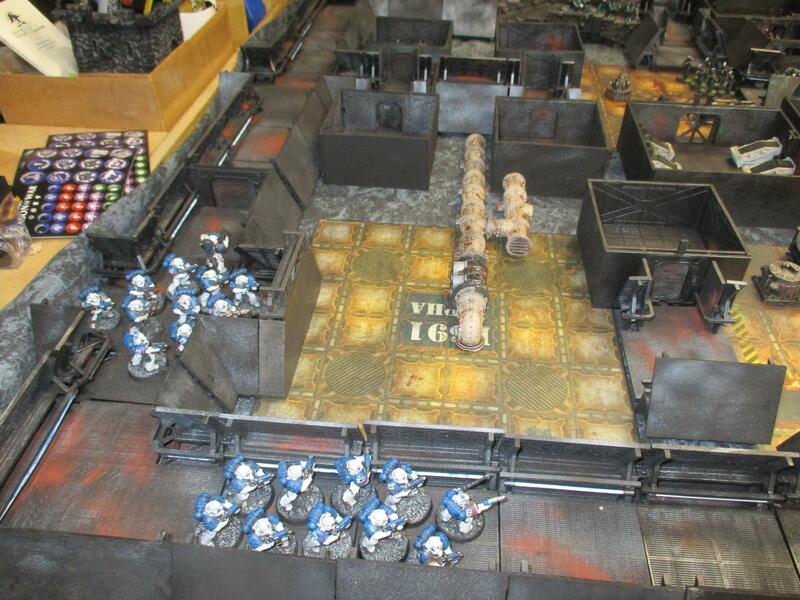 Barsk and Lorm did not need an invitation and were quickly wrecking the pumps and other machinery in the room. 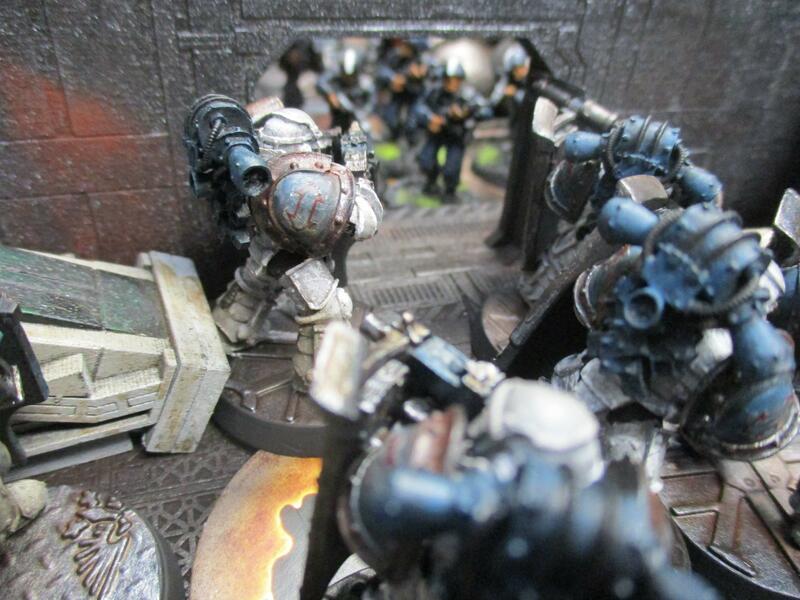 Bolter fire rattled behind them as the other members of their squad pinned down the Reavers. Barsk made way to the wall and started cutting through the bulk head in the side of the room away from both Gervoth and the Reavers. They had done enough damage now, they needed to make it back to the Stormbird to take the fight to another ship.